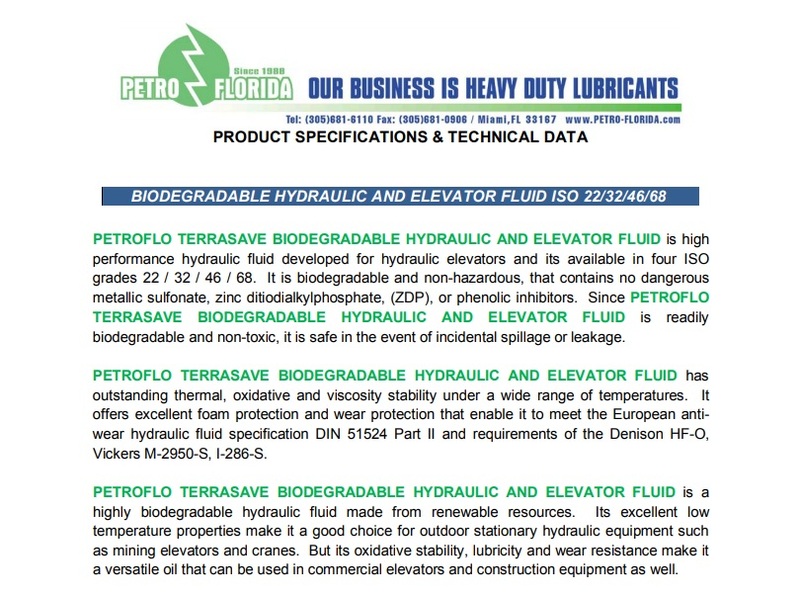 PETROFLO TERRASAVE BIODEGRADABLE HYDRAULIC ELEVATOR FLUID is an ISO 32 grade high performance hydraulic fluid developed for hydraulic elevators. It is biodegradable and non-hazardous, that contains no dangerous metallic sulfonate, zinc ditiodialkylphosphate, (ZDP), or phenolic inhibitors. Since PETROFLO TERRASAVE BIODEGRADABLE HYDRAULIC ELEVATOR FLUID is readily biodegradable and non-toxic, it is safe in the event of incidental spillage or leakage. It has outstanding thermal, oxidative and viscosity stability under a wide range of temperatures. It offers excellent foam protection and wear protection that enable it to meet the European anti-wear hydraulic fluid specification DIN 51524 Part II and requirements of the Denison HF-O. 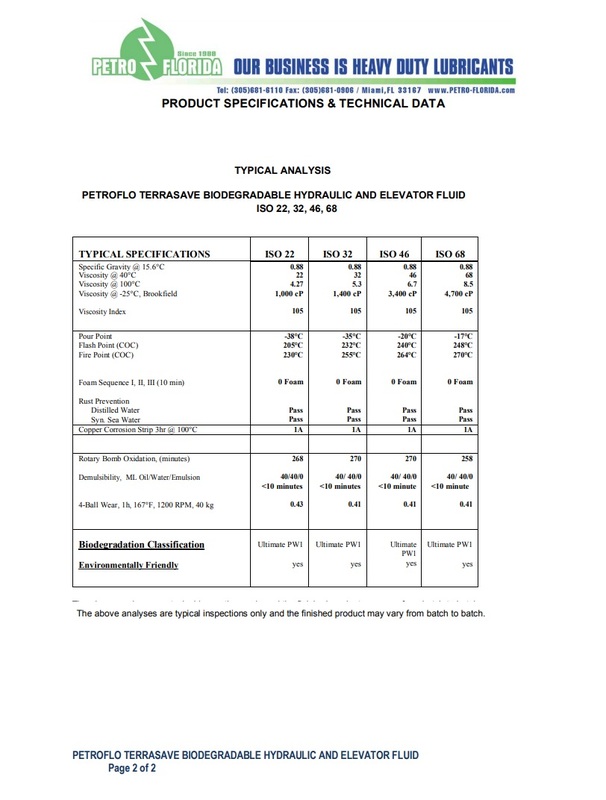 PETROFLO TERRASAVE biodegradable hydraulic fluid made from renewable resources. Its excellent low temperature properties make it a good choice for outdoor stationary hydraulic equipment such as mining elevators and cranes. But its oxidative stability, lubricity and wear resistance make it a versatile oil that can be used in commercial elevators and construction equipment as well. Always maintains proper viscosity over a wider temperature range. In cold temperatures, it remains more fluid so elevators won’t level in short of the floor. When hot, it remains more consistent allowing the valves to operate properly. Elevator take away, or lift off, is also smoother with PETROFLO TERRASAVE BIODEGRADABLE HYDRAULIC ELEVATOR FLUID since it does not have the sticky suction problem in the packaging gland which can occur with petroleum oil.